IWDification can be added--your choice of Spells, Items, and/or Tweaks. BG1-style Entangle spell for those who prefer the older version. Has anyone had the chance to try both SCS and Dark Horizons in the same run? Are they compatible with each other? The SCS seems to work on the DH NPC's but a place that seems untouched is the EE content, I just killed an NPc related to Dorn's personal quest and the AI was not up to scratch compared to SCS. Thanks @Staglord, that helps a bunch. It certainly doesn't sound significant enough to stop me from running both concurrently. Which of the two mods did you install first? Thanks for reminding me of that. That is an EE problem with the scripts that I assigned to the morning lords. I'll have to make my own custom scripts for them. So to answer your question DH first then SCS. @Staglord thanks for the heads up. Just created a mod some days ago. Yeah, html is a True Mess in mobile devices, but when getting into the forums from anywhere-but-not-home (aka Outside Candlekeep :P) is what truly matters, then you unleash all the power the Mobile Devices, mainly, by casting Dimension Door and entering the forums. @mlnevese, thanks, also (computers rock, especially OS X :P). I was going to ask if a category named "Useless mods that make you laugh" could be created (Ever heard of "The Sword of Noober" mod??? :P), but I think it fit fine in Tweaks. @mlnevese I thought about creating a Nosferatu invasion in Candlekeep, the only change will be that, Nosferatu will be attacking you instead of just Beholders. I also thought about a Drow conspiracy, but I really want to add some interesting characters from books, like Elric of Melibone, and, obviously, his array of magical items (Stormbringer, The Chaos Shield, maybe some magical armors...), just what I really need is impossible to grant in real life: Time, to make the mods. I've been working on a "Potion o' Everlasting, but, some things were wrong, and, the potion were consumed, but had no charges, so, a potion drank 2 times became a stack of 655535 potions of 1Ibs. Also, I don't know what effect to give to it, so I gave it 10 different effects (10% of each one), but none of them triggers. @CrevsDaak Naah if this gets seriously off topic I'll just split the discussion. You could take a look in some of the links in the modding tutorial thread. They could help a lot. Also some of the modders who are now part of the development team are glad to help... When bug fixing and implementing new features does not take all of their time. @mlnevese Kaeloree helped me with the WeiDU version, as the mod wasn't requiring a string for the "Beholder" name (I think it was string number 25505 or 2550), he said it was very easy to install, but right now I have to focus on different things (da damned school) either than Infinity Engine Modding (which his one of the most focusing hobbies I've ever seen, you can add items, NPCs, quest and the liking to BG, PS:T, and all those great game you've played more then once). 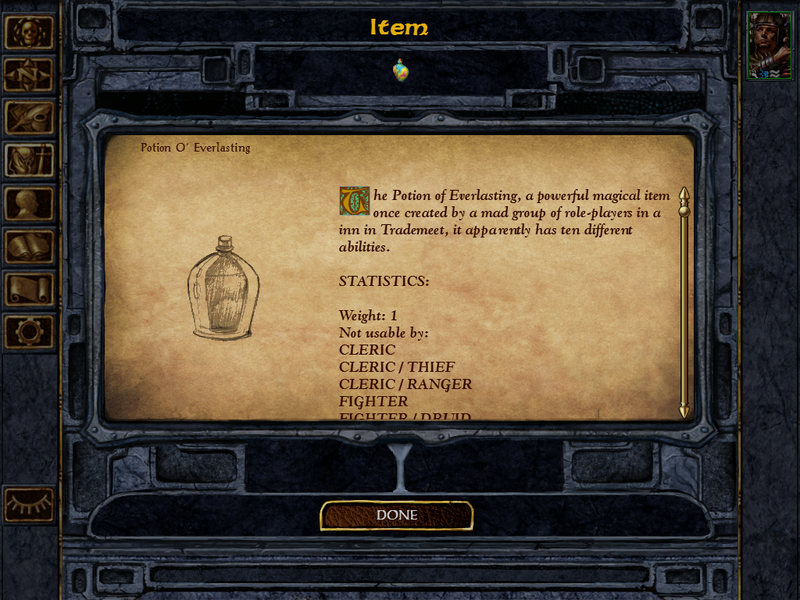 Also, about the Potion o' Everlasting, I'll just edit it to get replaced, and the chain they create won't be random, but it will be better than a bugged stack of 65550 potion that are useless (the description sees pretty, as well as the abilities, but a good luck nobody saw the results of those effects...). once again , i dont understand why this neera expansion pack, can't be officialy added to the game ? Can we get some more tutorials? Does anybody know of an up-to-date tutorial for adding inteerjections and banters for the NPC's? Wand Case for those who like to keep their inventories orderly. Hello guys i'am new entry of this forum and i 'am an italian player. I installed some of this kit mod but i have a problem, when i creating my character and i want to choose the kit, the kit have not a name and the descripition there isn't, and instead the name of the kit there is write "Missingstring 33225 " the number is change unlike the kit. Then can you help me please? @LayneStaley Obviously the mods you installed are not using the latest version of WeiDU so the strings added by the mod were not added to your prefered language. You need to uinstall the mods first. Then apply the instructions given in step 1 of this reference topic, for all your mods, then reinstall them.